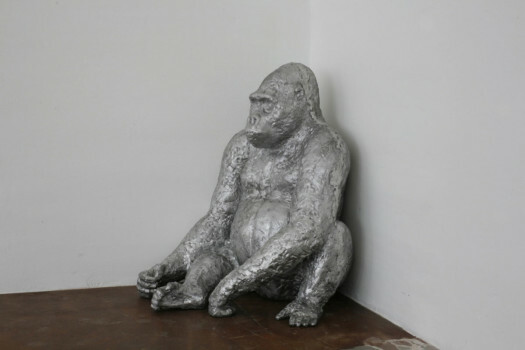 Being human is bad for the environment.Two gorillas, a llama, a banister broken into pieces, a bench from a suburban line station, a cistern, the concentrated beam of a spotlight, flattened packing cases and a teardrop – these are the exhibits in Jürgen Drescher`s current display at Galerie Isabella Czarnowska, gathered together under the title “party”. 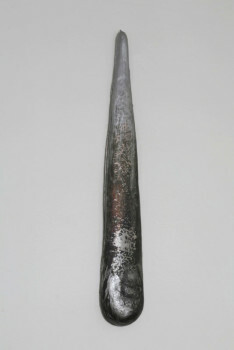 Making casts of objects has become an important part of Jürgen Drescher`s artistic practice. His chosen items are often everyday objects such as wooden banisters or packing cases. 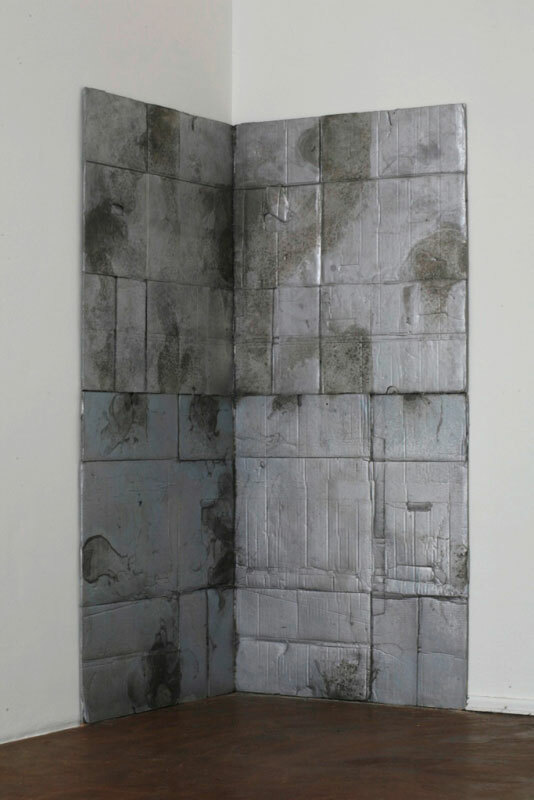 By reproducing them he expresses his appreciation of these ostensibly insignificant objects, the material or sculptural qualities of which often only become visible as a result of this transfer process. On many of the newel posts – which in their fragmented form make allusion to architecture or to an interior that has evidently been subject to brutal destruction – one can still see the runners through which the aluminium was poured into the negative form of the original object. 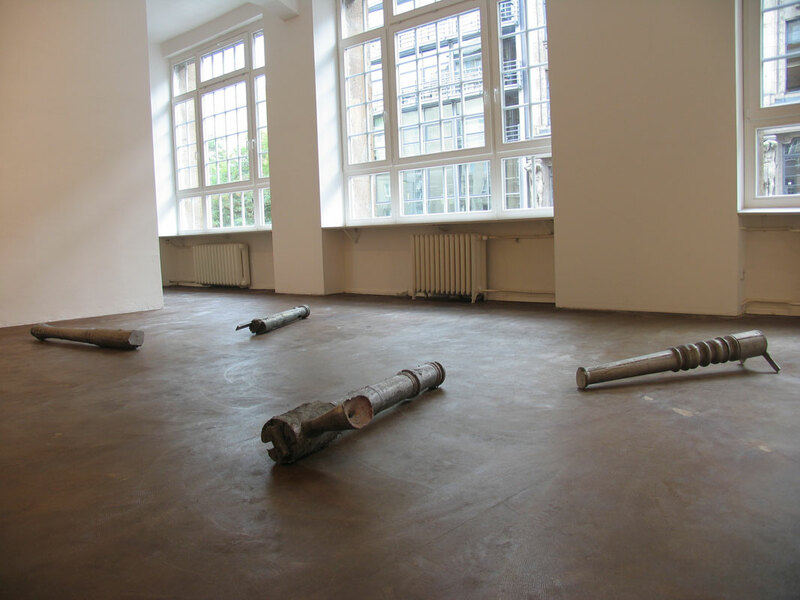 In her contribution to Jürgen Drescher`s recently published catalogue raisonné, Barbara Buchmaier writes: “Drescher allows the traces of rapid work on the sculptures to remain, consciously confronting the observer with the particular object`s production process. His sculptures consequently take on an unfinished character, and at first glance they seem `imperfect.`In this respect it is also more difficult to assess and evaluate them. in Jürgen Drescher. Arbeiten bis heute, published by Galerie Isabella Czarnowska (formerly Kacprzak) / Mai 36 (Cologne: Verlag der Buchhandlung Walther König, 2007), pp. 71-77, here p. 73.Unlike the balusters and packing cases in the current exhibition, which are casts of found objects, the animals that inhabit the gallery were initially modelled on photos and sketches. 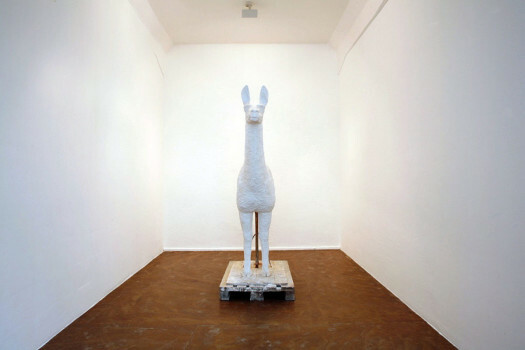 While Drescher`s method of dealing with the man-made objects was very direct, in that he used the actual objects as the basis for his casts, he wanted to approach the animals in a different way. As a result, despite being relatively true to life, his modelled sculptures of their bodies show noticeable differences from the real animals. This can be regarded `– without meaning to sound at all sentimental `– as a way of treating animals as fellow creatures and of examining our relationship to them through the process of reproducing their bodies. And who feels more lost? The gorillas crouched in the corner of the room, contemplating the balusters scattered over the floor like jackstraws, or the person who takes a seat on the smooth, seemingly oversized bench, with a filthy cistern on the wall behind him and a bright pool of light like the cone of a theatre spotlight on the ground before him? How do we adjust to a situation of homelessness? Should we go and stand in the corner formed by the packing cases and be ashamed of our very existence? Or is it not – in view of a global sense of forlornness and loss (of biodiversity and economic and social certainties) – time for a veritable party? 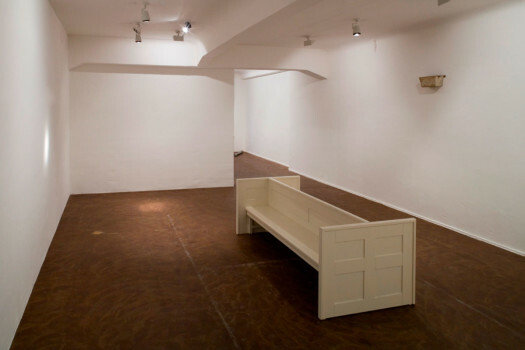 1 Buchmaier, Barbara: ‘Aspects of an Artist’s Existence’ in Jürgen Drescher. Arbeiten bis heute, published by Galerie Isabella Czarnowska (formerly Kacprzak) / Mai 36 (Cologne: Verlag der Buchhandlung Walther König, 2007), pp. 71-77, here p. 73.